Head lice are small, parasitic insects that infest hair on the head of people. Their six legs allow them to grasp and wander between hairs. They feed only on the blood of people, and feed once or more each day. They are more common on children than adults. A single insect is called a louse. A female louse can lay more than 100 eggs, called nits, in her lifetime. 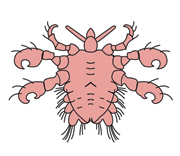 The female louse secretes a glue to attach each egg to a scalp hair, usually close to scalp level. They hatch about 8 days after they are laid, and grow to the adult stage about 9 to 12 days after hatching. Adult head lice survive just a few weeks on the scalp, but die within a day once removed from a person.